If instead, the user attempts to only use the Range objects directly, then the following code will return an error (Run-time error '438', Object doesn't support this property of method') on the second statement. While Copy is a Method of the Range object, the Paste item is not. The VBE Object Browser lists only the following objects: Chart, Floor, Point, Series, SeriesCollection, Walls and Worksheet as having a member Paste method. Instead, the Range.PasteSpecial method is available as shown in the next section. The Copy PasteSpecial methods are often used in the body of a loop. The user looping through each item in an Excel array, and copying certain items to another location. xlNone (-4142). From constants enumeration. Code 2b includes the default values for optional arguments to the PasteSpecial method. 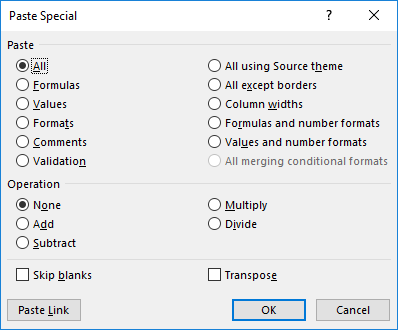 The corresponding Paste Special dialog box, with default arguments, is shown in figure 1. Instead of using the Copy, and PasteSpecial combination, the Copy method can be used with an optional destination argument. Code 3 line 50. A fourth option is to use an assignment statement. To assign a to b, the syntax is b = a. See Code 4 line 71.